A lot of this is my opinion and while I am glad to provide data to back up most of my claims (and will do so) a lot of this is based on my personal paradigm and experiences. If you disagree, feel free! I'd like to hear some interesting dialogue on the subject from a variety of folks. This is not a complete chart, but if you go back to about 1970 or so, you will see a downward trend until 2011— there's been a slight uptick. Regardless, look at the figures. 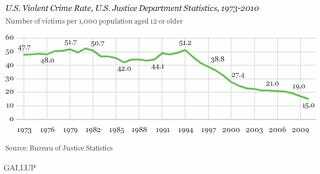 Look at how much the crime rate in general has dropped even on a per capita basis. We are safer today than we were decades ago, and yet people are raising their children to be more afraid than ever. Personally, I find this pernicious and cruel. I find the fact that we hear stories of parents (mostly mothers) being called irresponsible for leaving a child alone for mere minutes at a time to be terrifyingly Orwellian. Forget the state, who needs CCTV when the public will serve as the panopticon for the state? By encouraging the culture of fear, we encourage people to punish parents (again, mostly women) for letting their children so much as explore the world. Think about it for a second: Calvin and Hobbes's parents would be locked up by CPS for letting young Calvin walk to school on his own or, GASP, explore his back yard in his wagon. Exploring? Forget it. There's danger at every turn. By teaching children to be afraid of the world, we're teaching them to shut out its wonder, explore, and learn how to manage risk on their own. I had a friend recently gasp when I told him that I would allow my child to walk/bike to a friend's house as early as the age of 8 (depending on the layout of the streets, given how most Orange County roads are practically highways). I believe strongly that children should be allowed time to explore the world on their own, to fall down and hurt themselves, to learn how to cope with the challenges of life on their own. But to my friend (a guy, for the record) that was tantamount to child endangerment. And... he's probably closer to the norm today than I am. This attitude is, frankly, terrible for us. The world is better and safer every day, and we retreat more and more inward and away from it. Nearly every neighborhood around where I live is either walled in or gated. People are terrified of their neighbors, of each other, and of strangers when, paradoxically, it's likely those closest to us who are usually most likely to hurt our children. Some of my best experiences in my childhood were being told, "go out, explore, but be home for dinner." I wonder if perhaps I'd be told I'm a deficient parent here in Orange County if I let my kid go walking to the store on their own. I'm inclined to think so. Here's where it gets hard to fix: people are terrible at measuring risk. Studies show that people see 30% chance of rain as being different perceived risk in Seattle than in Phoenix. We all like to think that we're rational and great at measuring these risks as they pertain to us, but we're really not. How many people do you know who are uncomfortable with flying, but are more than happy to drive all day long? We're terrible at these sorts of evaluations. This is why I also think the cultural climate is so terrible: even if the fact is that risk is down, people perceive the risk to be higher because the media is so good at spreading that message. Even if your actual risk of being assaulted or robbed is down, your perceived risk may not be. Hence why so many parents make the choice to keep their children under supervision at all times. Never mind that the risk of abduction with a relative is probably higher than with a stranger (statistically), the perceived risk is lower. I'm not saying there is no risk. Risk is still there. But the response we have today to the perceived risk far outweighs the actual risk, leading to unnecessary fear and ennui. We should feel better when we actually feel worse. That's not good. But at the same time, people shouldn't discount risk entirely. A culture of fear produces a climate of distrust, discord, and lack of meaningful dialogue. When everyone is skeptical of everyone, organizational improvement is stymied, people become less likely to form new bonds and build social capital, and we become less likely to see the good in others' actions. More to the point of parenting, I think it creates a punitive culture around parenting that forces parents to feel paranoid that others may punish them for otherwise benign choices. The risk of children dying while sitting in the back seat of a car may be higher than the child's risk of walking to school, but which one is more likely to receive community disdain today? And who do you suppose gets blamed first? However, I realize I'm a bit on the "laissez-faire" side of this, so I'm curious what others think. Pitch in and tell us what you think!